National Aeronautics and Space Administration (NASA) announced the agency will postpone the launch of the InSight spacecraft that is being developed to reach the planet Mars, because a vacuum leak was identified in the probes of a seismometer instrument that can measure ground movements as small as the diameter of an atom, and it doesn’t seem possible it can be fixed in time. The NASA will try to send humans to the Red Planet by 2025. According to NASA official website the probe would not accomplish its function if the leak is not corrected and it is very important because it is needed to measure the seismic activity of Mars which has the called Marsquakes that seem fundamental to understand the nature of the interior of the planet. 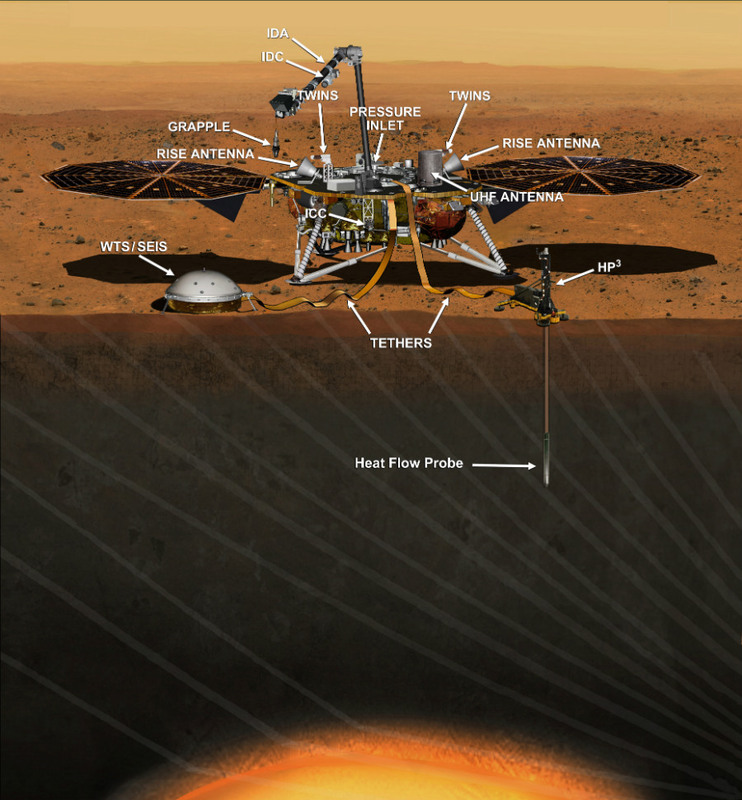 This artist’s concept from August 2015 depicts NASA’s InSight Mars lander fully deployed for studying the deep interior of Mars. The mission will launch during the period March 4 to March 30, 2016, and land on Mars Sept. 28, 2016. The space agency explained in a statement that Mars is a great destination for scientific discoverie because its formation and evolution are compatible to Earth so we could learn more about us if we understand how the red planet works. Nasa affirmed they were fully committed to the scientific discovery and exploration of Mars, however there is not enough time to resolve the leak that was discovered on Monday when researchers tested the seismometer in extremely cold temperatures (-49 degrees Fahrenheit/-45 degrees Celsius), in order to launch the mission in the scheduled time. Mars will be surrounded by complex machines developed by the NASA, Opportunity and Curiosity rovers will be exploring the Martian surface, the Odyssey and Mars Reconnaissance Orbiter Spacecraft will be orbiting the planet, and it is planned humans will travel to the Red Planet, all by 2025. The NASA will get its budget increased by almost $1.3 billion. On December 16 the Congress announced the space agency that took the man to the Moon will receive $19.3 billion for 2016 fiscal year. Most of the programs of the agency will be funded with the needed amount and several of them will receive more money than expected. The Space Launch System was one the most benefited by the the approved budget. It will receive $2 billion in the omnibus spending bill. The administration had requested $1.36 billion, the project received almost 50 percent more than it was expected. Dr. Mary Lynne Dittmar, Executive Director of the Coalition for Space Exploration said the investments represent a strong commitment to America’s human, robotic and science exploration programs.